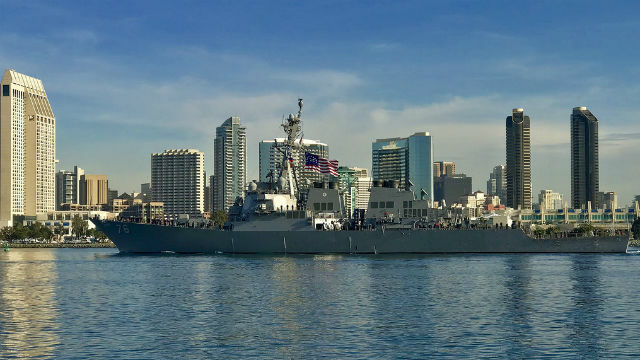 The forward-deployed guided-missile cruiser USS Antietam and San Diego-based guided-missile destroyer USS Higgins sailed within 12 nautical miles of islands claimed by China on Sunday in a freedom-of-navigation exercise. The mission, reported by Reuters and other international news outlets, is the latest in the series around islands by fortified by the Chinese in the South China Sea. Hong Kong’s English-language South China Morning Post reported that the ships maneuvered near Tree, Lincoln, Triton and Woody islands in the Paracel Islands group. The archipelago of coral islands, reefs and shoals is claimed by China, Taiwan and Vietnam. Just days ago the Navy disinvited China from the 2018 Rim of the Pacific exercise to protest the growing militarization of islands in the South China Sea. The Navy did not comment on Sunday’s operation, but said ships operate in the region on a daily basis.